The discipline of digital humanities is difficult to define. However, a look into the ways digital humanities is being defined may reveal much more than the simple application of computational tools and methods to traditional humanities disciplines. Looking at the growing field of literature to define digital humanities provides an important insight into the dynamics of disciplinary formation. Reading the foreword to Computers and the Humanities (the field’s first journal, 1966) one will realize that during this period, digital humanities was not considered as being distinct from traditional humanities. The writings published between the periods 1980s and 2000 mostly looked into defining the field of digital humanities from the perspective of teaching. A project named Advanced Computing in the Humanities published a book exploring the ways in which digital humanities might be taught. A recurring theme in the discipline has been the inter-relatedness of the traditional and digital humanities. Scholars have time and again emphasized on the ways in which digital humanities allows us to reconnect with the age old concerns of humanities. Scholars have pointed out that digital humanities can not only have the capacity to organize and search large bodies of information but they may also create research infrastructures that can be greatly beneficial for more critical studies. A newcomer might need to get acquainted with the community before diving into digital humanities work. Many in the digital humanities community are to some extent self-taught and/or have gained their knowledge through work on projects rather than through formal training. One has to be open-minded, experimental, and playful, understanding the learning in a specific project and finding insightful people to discuss the work. One trend in both humanities research and teaching practice is the move towards a more practical activity, intensifying deep thought processes to include the creation practices that are interactive and often technologically mediated. In the domains of teaching and learning, this has led to maker movements where the active thinking that underpins cognitive theories is extended to include students’ participation in artifact creation. This includes everything from circuit building, to digital storytelling, to mobile application design. Scholars have stressed on digital humanities to be thinking-through-practice; a production based endeavour in which theoretical issues get tested through implementation. Interdisciplinary collaborations to advance theory and practice are another important development in the field of humanities research. Though interdisciplinarity is not new within the humanities, scholars have found the process of integrating knowledge from other disciplines exciting. As Ryan Cordell, Assistant Professor of English, Northeastern University, puts it, one can understand this inderdisciplinarity from the perspective of one’s own discipline and develop proficiency in diverse epistemological frameworks and accompanying methods. So, humanities scholars, for example, are not necessarily becoming coders, but are developing computational literacies that will unravel new methods and may allow them to collaborate with programmers to come up with new research interfaces. Another important development is the move towards multimodality or communicating through distinct forms of representation (e.g. textual, spatial, linguistic, aural, etc.). Multimodality is foundational to constructionist knowledge building. It is necessary to support multimodality to accommodate distinct learning styles, and also to take advantage of multimodal learning artifacts that can provide a richer understanding of outcomes. The multimodal humanities bring together scholarly tools, databases, networked writing and peer-to-peer commentary while also using the potential of the visual and aural media that are part of contemporary life. The development of digital technologies has facilitated the advancement of humanities research towards more collaborative, interdisciplinary, and multimodal endeavours. Digitally-enhanced collaborations have the potential to bring about distributed knowledge building that not only advances existing understanding, but creates new forms of understanding. The question that everyone in the 21st century faces is whether there can be a digital pedagogy without computers. In the midst of the debates on how computers and Internet affect reading, cognition, and learning, there have been critiques about the interest that exists among individuals and groups to technologize education. There is a fear that there can be harmful effects on learning as a result of technology. However, people are also sympathetic to the use of educational and humanities computing as they believe that technology cannot change the classroom without first changing the pedagogy. As a result, discussions about digital pedagogy and effective uses of instructional technologies are flourishing across social media as well as conventional academic settings. One can cite the example of various websites that encourage users to use social media to create an understanding about various cultures. For example, the Selfiecity project created by a team of students and professionals under the guidance of Lev Manovich in USA. 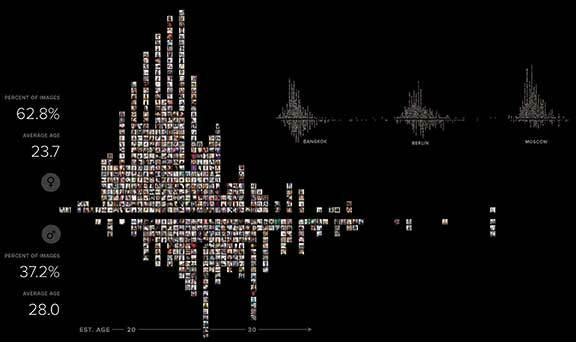 The project mainly explores a dataset of 3200 Instagram selfie photos shared in five global cities, and separate visualizations of these photos have been created with custom software. This interactive web app has been beneficial in understanding the ways in which one can approach the social media images theoretically, as people all over the world differ in ways of positioning themselves before the camera. Similarly, Storify is another site that lets users create stories or timelines using social media websites like Facebook, Twitter and Instagram. A user can import content from different websites into the timeline. These kinds of websites encourage students to be active members in the learning projects. A number of school and college students in the developed countries are increasingly using Storify as part of their assignments. The content that they create by using various sources makes them comprehend a topic in a much better way. One of the most common shortcomings of digital pedagogy is how frequently it gets conceived in terms of instructional technology. Many teachers (the ones who are early or non adopters) assume that digital pedagogy is something that uses electronic tools or computers. This often limits the teaching to the extent of its tools. Machines are becoming fascinating interpretative machines. But what is difficult is imagining how to use them. How do we work towards the learning environments we may have never had before? How might we even imagine a “digital pedagogy” without the potentially limiting factor of electronics? Perhaps, a few examples from existing classroom practices may provide us with some clues. We can take the example of José Bowen, Dean at Southern Methodist University in Texas, USA. His modest proposal was to “teach naked”, meaning removing all the computers and projectors from his classroom, which he did at SMU. It was basically a response to the ineptness of pedagogy when it gets governed by the tools it uses: in short, by those PowerPoint lectures that create boredom in a range of bullet points. He advocates offering students podcasts and online discussion groups and even PowerPoint lectures, but outside of class meetings. During class time, Bowen invites all the Q&A and in-person discussion that these technologies have displaced. Taking a similar approach at the high-school level, chemistry teachers Jonathan Bergmann and Aaron Sams are successfully experimenting with vodcasting to create what they call “the flipped classroom”. The students bring questions about the digital resources they have used in preparation for the class. So, perhaps with thoughtful use, instructional technology may not be displaced instead they can be moved to the pedagogical periphery. According to Sean Latham, Professor of English at the University of Tulsa, cultural studies is looked upon as a technology itself, where students can navigate electronic realms, archived and differentiated cultural objects. It further empowers them to create interpretations of their own in these emerging digital spaces. The archival repositories created by the universities and schools form an important point of collaboration between the physical and digital worlds. The Bichitra project formed by the School of Cultural Texts and Records, Jadavpur University is an excellent example of this. The project has not only digitized Rabindranath Tagore’s manuscript and works, but also provided transcripts, search engines and collation engines to locate words and phrases of his works and compare different versions of his work. Similarly, the Pad.ma (Public Access Digital Media Archive) project is a searchable online archive of densely text-annotated video material, consisting mainly footage and not finished films. The website has been created by CAMP, from Mumbai, 0x2620 from Berlin, the Alternative Law Forum from Bangalore and Majlis and Point of View from Mumbai. It offers options to view the clips, edit and add annotations, find locations related to the particular video, in short, acts as an important online repository to edit and use vidoes for learning. The Geographic Information System (GIS) software also helps students and scholars worldwide to map out ethnic, cultural and linguistic diversities. An interesting example in this regard is the map on violence created by the Dutch company LAB1100. The map extracts structured information from various sites and provides a comprehensive visual overview of the battles fought around the world. These kinds of projects help teachers teach history to school students in a visually interesting manner, thus making the process interactive. One might plant documents related to modernist little magazines: letters, corrected page proofs, sample issues, reviews, newspaper stories, and various images. The subject can be just about anything. Imagine another collection of materials relating to cholera outbreak in Victorian London and the imagination of individual and collective identity in urban spaces. One might offer maps, statistical surveys, journalistic exposés, emotional editorials, urban plans and pieces of fiction. Students can assemble and present to the class the critical narratives they collaboratively determine and argue. Discussion can proceed about how to present, exhibit, or visualize those relations. This is old and new fashioned at once. So, cultural studies only fulfills the promise of its method in the digital realm, where we sort and resort contingent, rare, popular, and heterogeneous materials into dynamic critical narratives. Text mining a novel with highlighters restores the missing labour of search. This makes students reflect on how their reading labour is both constitutive and mediated. Brad Pasanek who teaches British literature of the 18th century conducted an exercise to hold on to the attention of his students. 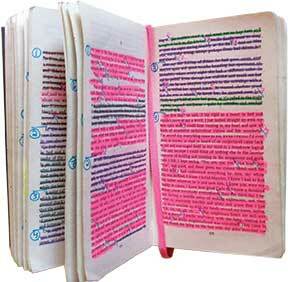 He went home and “text mined” the novel with pink and blue highlighters. The colour pink for every reference of “pride”, blue for “prejudice”. The next class he returned with his marked-up book, flipping through the pages to show the bursts of colour. The class actively participated and started correlating them to important moments in the plot, to transitions in how the key terms were conceived. The exercise was an ice breaker. The exercise looks differently into the act of reading, by revealing its link with digital text mining, and offers insights that may not solely exist in either realm. One can then assume to develop a pedagogy that engages the world. Asking the students to edit and add articles in Wikipedia provides an opportunity for the students to actively engage with the world around them. Here the students discuss the content gaps and topics that have been sidelined and this can have a great impact on public culture, on who and what is represented in a source the students use every day. Such a practice can highly motivate the students by making them learn more about the aspects of producing content rather than staying mere consumers of digital media. Digital projects can pave a path for humanities by demonstrating the importance of humanities and cultural studies by applying them to digital texts and interfaces. Conversations and partnerships with digital humanities scholars and practitioners can help develop the right pedagogy for students in the classroom environment. So, in a way digital humanities is trying to redefine the boundaries among the humanities, the social sciences, the arts, and the natural sciences, impacting interdisciplinarity. New forms of inquiry and knowledge production are being developed to train the new generation of humanists, and in order to achieve this goal, teachers are resorting to hands-on, project-based learning along with classroom teaching. The author is an Assistant Professor at Future Media School and a research scholar at Jadavpur University. She can be reached at mail.sushmitapandit@gmail.com.